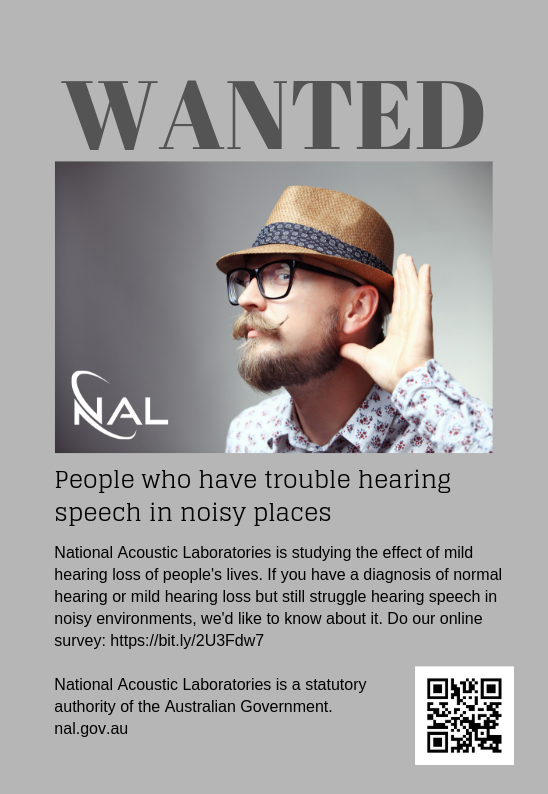 A team of the National Acoustic Laboratories is now collecting data on the experiences of people with normal hearing or mild hearing loss who have greater-than-normal difficulty understanding speech in noise, as well as the clinicians who see these clients. The aim of this research is to further understand the difficulties experienced by this population and to develop effective treatment options for them. If you fit into these categories, we would love to have you involved in our research! If you are interested in sharing your insights with us and participating in a personal or phone interview, please contact Dr Joaquin Valderrama (NAL) at the email joaquin.valderrama@nal.gov.au. For people with speech-in-noise difficulties: https://bit.ly/2U3Fdw7. For clinicians / audiologists: https://bit.ly/2TVfaH7. This research is approved by the Australian Hearing Human Research Ethics Committee (Ref no. AHHREC2018-34). NAL is the research division of Australian Hearing, an Australian Government statutory authority.